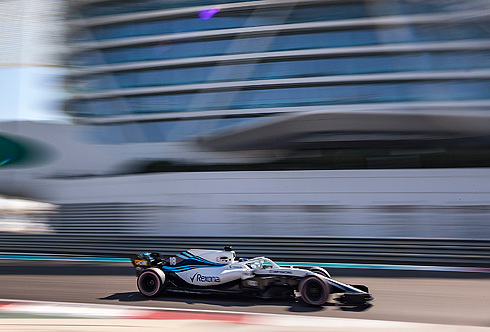 The final practice session of the 2018 Formula One season at the 2018 Abu Dhabi GP would see the Williams Martini team continue to struggle with both drivers finishing near the bottom of the times. Lance Stroll would set a time that would see him move into 10th but as the session progressed he would drop to 18th. 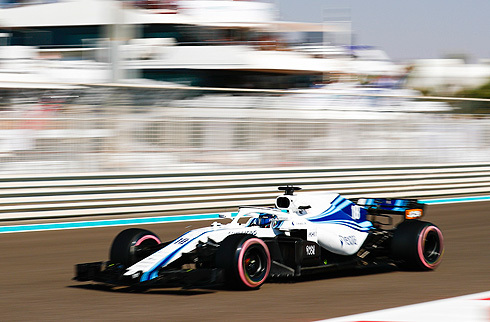 For team-mate Sergey Sirotkin his session would see him struggle to get a time that would see him move off the bottom of the order finishing in 20th. Qualifying is likely to see more of the same. After the early runs it would be Vettel quickest with a 1m:38.668 followed by Raikkonen and Gasly, all on the hypersoft tyre. 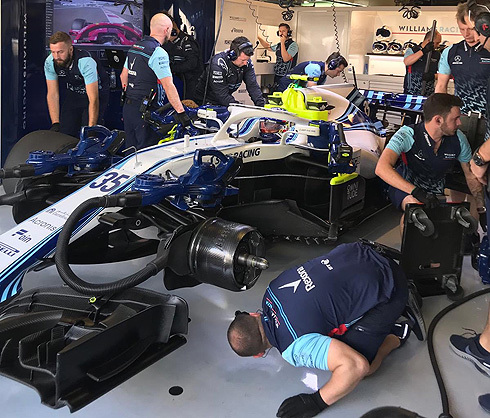 Both Williams drivers had completed runs on the hypersoft tyre and were currently 11th and 12th with thirty five minutes remaining. Hamilton was now second but Verstappen would take this spot but was on the ultrasoft tyre. Hamilton was now third followed by Raikkonen, Bottas, Ricciardo, Gasly, Hartley, Leclerc and Grosjean in tenth. The Williams drivers had now dropped to 17th and 18th. Hamilton would improve to move ahead of Verstappen. Drivers would start to come out for runs on new hypersoft tyres including Vettel and Hamilton. Vettel would set a 1m:37.587 to extend his quickest lap but Hamilton was also on a quicker lap setting a 1m:37.176 to move ahead of Vettel. Bottas would move up to third followed by Verstappen, Raikkonen, Perez, Ricciardo, and Alonso in eighth. Raikkonen was also on a quick lap on the hypersoft and would move into second ahead of Vettel. Ricciardo and Verstappen were now fifth and sixth. But Verstappen would improve to be fourth ahead of Bottas. Ricciardo would pull off the track with what was a water pressure issue. With the end of the session the top ten was Hamilton, Raikkonen, Vettel, Verstappen, Bottas, Ricciardo, Grosjean, Hulkenberg, Sainz and Ocon tenth. The Williams drivers would finish in 18th and 20th which was totally unsurprising. Lance would complete his first run using used hypersoft tyre setting a time of 1m:41.500. With thirty minutes remaining Lance would return also on a new set of hypersoft tyres. Lance was now down in 19th as he started his run. lance was on an improved lap and would set a 1m:40.321 to be eighth. he would drop to ninth with twenty five minutes remaining in the session. Lance would comment that after his run the hypersoft tyres did not have much gript left. Lance would pit after a short four lap run. In his pit Lance would drop to tenth then eleventh. Lance would return for a second run on new hypersoft tyres. He would set a 1m:40.117 but this would only see him 13th. He would drop to 18th as others completed their hypersoft tyre runs. With the end of the session this is where he would remain. Sergey had also completed a run using used hypersoft tyre setting a time of 1m:42.574. Sergey would return for a second run but this time he was on a new set of hypersoft tyres. Sergey would set an improved 1m:41.182 to now be 17th. He would drop to 18th as he continued to lap the circuit. Sergey would pit after a seven lap run. With nine minutes remaining and Sergey would return for a second run on new hypersoft tyres. Sergey had dropped to 20th and was not able to improve his time as the session ended.